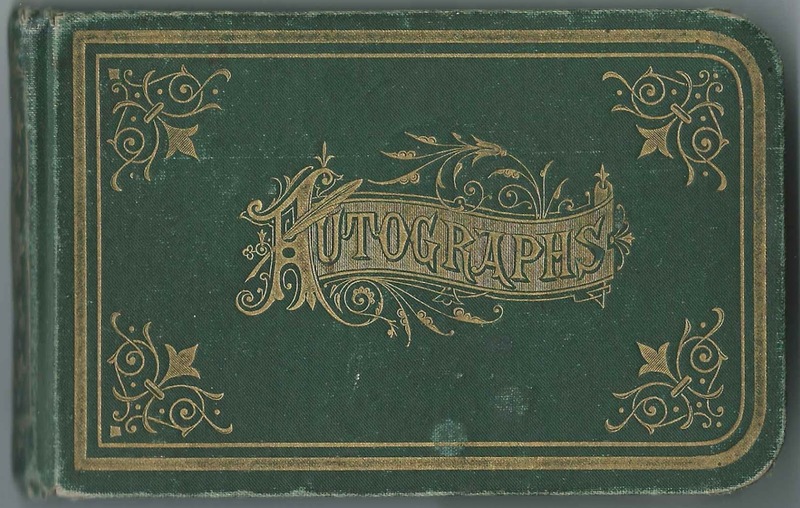 1870s-1880s autograph album that belonged to George H. Knox, Jr., of Berwick, Maine. 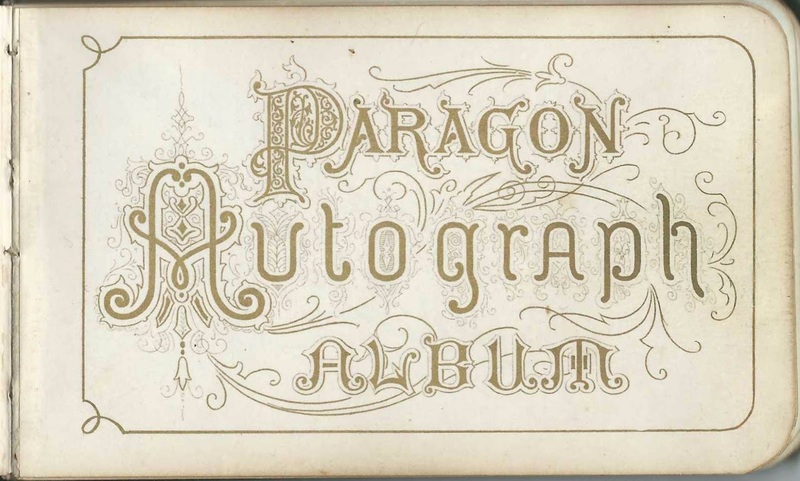 Based on the earliest inscriptions, I believe George received the album on Christmas Day in 1876 or on his birthday, which also occurred in December. 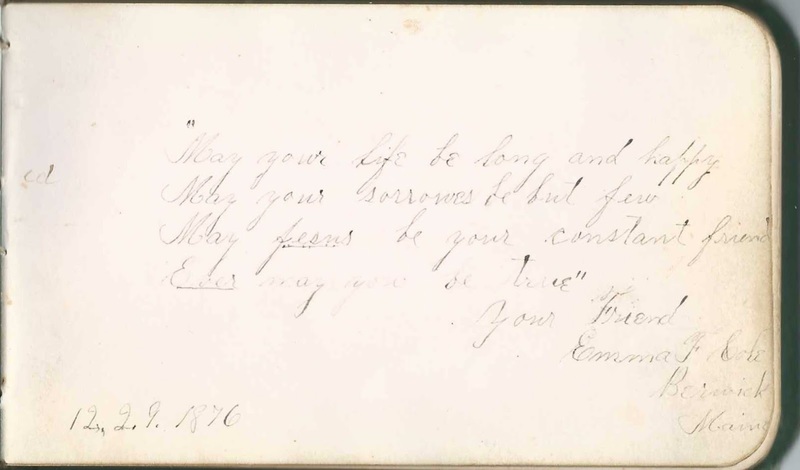 The album measures approximately 5-1/4" by 3-1/4" and contains the sentiments of 40 of George's relatives, friends and pastors. An alphabetical surname list and an alphabetical list of the inscribers, together with any personal information they offered, appear at the end of this post. 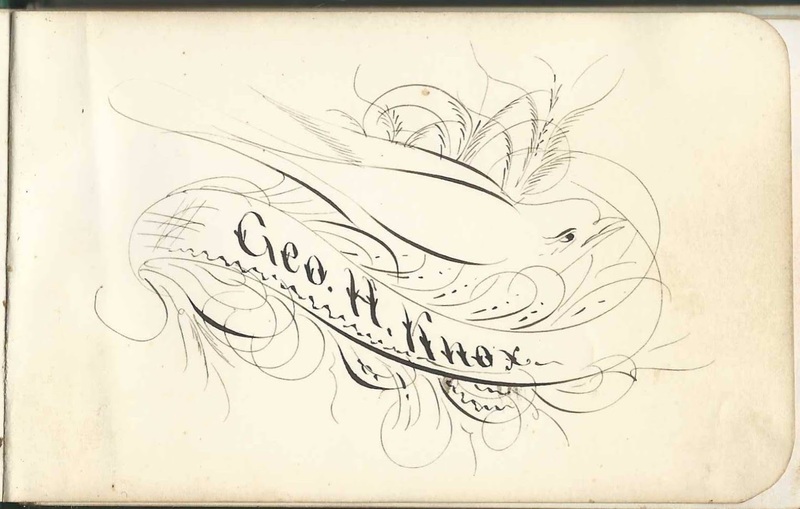 George H. Knox, Jr., was born about December 1858 in Maine, the son of George H. Knox, Sr., and Hannah Lydia (Cole) Knox. On February 1, 1885 at Rochester, New Hampshire, George H. Knox, Jr., married Emma F. Cole, daughter of James and Lydia (Varney) Cole. Incidentally, several people with the surname Cole inscribed pages in the album, including George's future wife Emma, who inscribed her page at Berwick, Maine, on December 29, 1876. George and Emma lived at Buxton, Maine, where they operated a lumber mill. If you have corrections and/or additions to the information above, please leave a comment or contact me directly. David N. Hanson, Jr. of New York; inscribed at Berwick, Maine, on July 27, 1878. He inscribed another page in August 1878, in which he gave his address as Brooklyn, New York. David N. Hanson of Brooklyn, New York; inscribed on August 18, 1878. He inscribed another page in July 1878. Written upside down: Frank J. Hubbard of Berwick, Maine; "Merry Christmas '76'". His sister Ida I. Hubbard inscribed the right facing page. Ida I. Hubbard of Berwick, Maine; inscribed December 25, 1876; her brother Frank J. Hubbard inscribed the left facing page. William S. Pierce of Berwick, Maine; inscribed on April 30, 1878. The page also has this: "Go ahead, D.C."
Joseph W. Presby of East Rochester, New Hampshire; inscribed on June 12, 1886. He was Rev. Joseph Waite Presby (1850-1924), whose wife Isabel (Severance) Presby inscribed the right facing page. Isabel Presby of East Rochester, New Hampshire; inscribed on June 12, 1886. She was Isabel (Severance) Presby (1858-1937), whose husband Rev. Joseph Waite Presby inscribed the left facing page. Charles W. Rankin; inscribed January 12, 1876. I believe Charles meant to write the year 1877. Mamie L. Rankin of Berwick, Maine; inscribed on "1-12-77"
Harrison Webster of Berwick, Maine; his wife Susan Anna (Libby) Knox, "Susie", inscribed the right facing page. 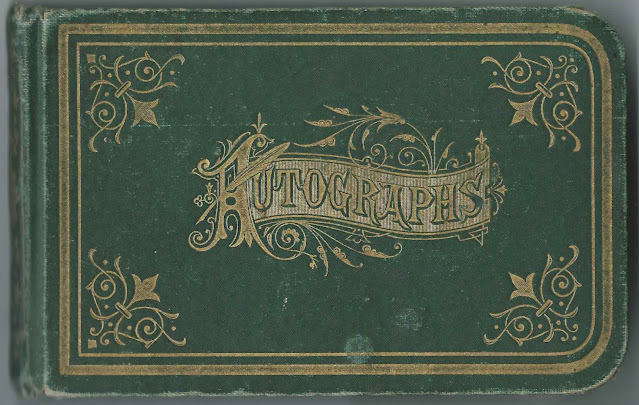 Susie Webster of Berwick, Maine; her husband Harrison Webster inscribed the left facing page. F. I. Wheat of East Rochester, New Hampshire; inscribed on April 12, 1888. Presumably Frank Irving Wheat, who became a minister at Rochester in April 1887 either while a student at Boston University or just afterward.